They weren’t exactly bridges over troubled water. But here’s the trouble: They had to be engineered well enough to hold 200 pounds – lovingly cradle every ounce – but without the bough breaking and, unlike the famous children’s rhyme about the one in London, without falling down. Teams of mechanical engineering whizzes, with that spark of well-studied know-how and construction savvy in their eyes, had this challenge: Build a suspension bridge from kid-friendly K’Nex sets, keep the cost within a slim-and-trim $200 materials budget (each K’Nex piece was assigned a price), and — oh yeah — make sure your awesome K’Nex set bridge is able to hold 200 pounds of weight. 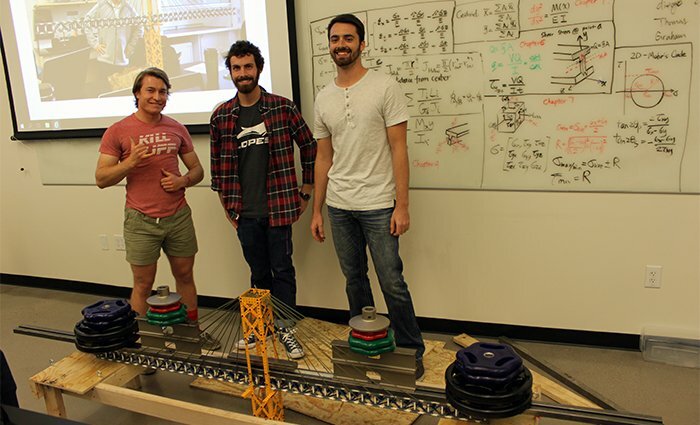 Haydon Hinson, Hunter Hoyt and Tobin Morse (from left) and their fellow mechanical engineering classmates had to conceptualize their bridges on a computer before the build and had to keep the price of the bridge at $200 or less (each piece of K’Nex was assigned a price). 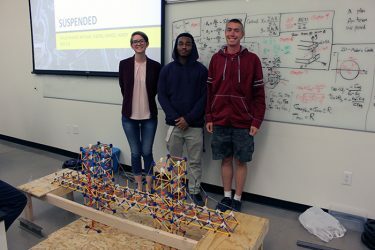 The assignment – lovingly dubbed the Suspension Bridge Project — was a gauntlet thrown down by College of Science, Engineering and Technology professor Li Tan and one accepted by the students in his MEE 352 class. The students presented their bridges, suspended with the help of fishing lines, paracord and the like, as their lab project while, across the hallway, fellow engineering students raced battery-operated cars. The project spurred them on to understanding concepts such as force, stress and weight distribution – the big players in a bridge-building project – and how they interact together in a structure. Students built 3D, virtual models of their bridges on a computer, where the structures underwent redesigns if they needed it. 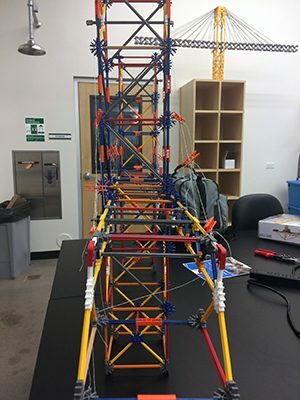 Once their conceptual bridge looked as if they met the challenge, they then broke out their GCU-supplied K’Nex sets and started the toy-sized, real-life builds. Tan said the project also included Christian worldview concepts, such as the ethical questions surrounding the project: Is it ethical to stretch a job out longer than it needs to last just to make more money, or should you always aim to get the job done under time and under budget? What about the environmental impact of your construction project? Or cost vs. safety? 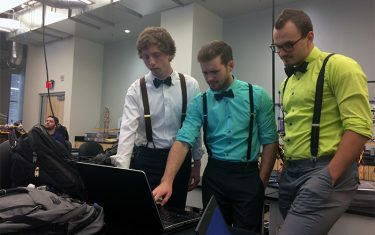 Haydon Hinson, Hunter Hoyt and Tobin Morse dressed in dapper fashion for their presentation, complete with solid-colored shirts, bow ties and suspenders. Their bridge, dappled with yellow, dark blue, orange and white K’Nex pieces, didn’t come without some issues. The team saw connector pieces start to bend during the pre-presentation testing phase, so it reduced the bending by including additional spacers. The bridge was able to support 74 pounds before breaking. This team used paracords in their bridge design rather than fishing line. But, with labor included – that’s 4.25 hours multiplied by $50 an hour for four engineers – customers were looking at some definite labor costs. Things the team members learned: Next time, they would use paracord instead of fishing line, would include more metal, would employ a trapezoidal tower design and would consider using better cable attachments. “The kryptonite was the way we assembled the bridge. There were too many breaking points,” Hoyt said after the presentation. “So it’s a matter of putting the right material in the right position” to avoid bridge failure at specific points. He added that communication is, by far, the most important thing when working on a team. Team members all had ideas they wanted to include in the design and had to decide which ideas to use. 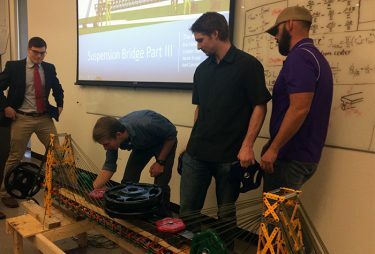 Junior engineering student Cooper Davis said his team spent two to three weeks designing and four days building its suspension bridge, which was book-ended by trapezoidal cable towers incorporating line upon line of paracord diving down from the tops of those towers to the deck below. Tan said the suspension bridge project teaches mechanical engineering students about force, stress and weight distribution. The MEE 352 class focuses on static and solid mechanics. The team members, he added, quickly realized that fishing line was only going to get the bridge to hold 100 or so pounds, so they switched to paracord. They also learned to be mindful of how weight is distributed through the ropes. The team’s bridge held 216 pounds, though that total didn’t come close to Graham Guskey’s team. “Ours was one tower, but we had the strongest deck built,” he said of the bridge – a completely suspended bridge whose deck swayed when carried. It was able to hold 866 pounds of weight. He credited the strength of the deck to the team weaving paracord through the base to make it “more compressive.” The force goes into the cords themselves, he said. Hoyt said he played with K’Nex as a kid, building roller-coasters, but never had used them to engineer something as complex as a suspension bridge able to support 200 pounds. What Guskey most enjoyed most about the project was seeing the team’s bridge stand up to heavier and heavier weights. “It’s still not failing,” he said with some wonder in his voice.